substance that can cause a change in the rate of a chemical reaction without itself being consumed in the reaction; the changing of the reaction rate by use of a catalyst is called catalysis. ..... Click the link for more information. , a process accomplished by yeast cells and long known to the brewing industry, which occupied the attention of many 19th-century chemists. Louis Pasteur recognized in 1860 that enzymes were essential to fermentation but assumed that their catalytic action was inextricably linked with the structure and life of the yeast cell. Not until 1897 was it shown by German chemist Edward Büchner that cell-free extracts of yeast could ferment sugars to alcohol and carbon dioxide; Büchner denoted his preparation zymase. This important achievement was the first indication that enzymes could function independently of the cell. enzyme produced in the mucosal lining of the stomach that acts to degrade protein. Pepsin is one of three principal protein-degrading, or proteolytic, enzymes in the digestive system, the other two being chymotrypsin and trypsin. , proteolytic, or protein-digesting, enzyme active in the mammalian intestinal tract. It catalyzes the hydrolysis of proteins, degrading them into smaller molecules called peptides. Peptides are further split into free amino acids. enzyme that acts to degrade protein; it is often referred to as a proteolytic enzyme, or proteinase. Trypsin is one of the three principal digestive proteinases, the other two being pepsin and chymotrypsin. ..... Click the link for more information. were successfully crystallized; it was confirmed that the crystals were protein, and the protein nature of enzymes was thereby firmly established. Like all catalysts, enzymes accelerate the rates of reactions while experiencing no permanent chemical modification as a result of their participation. Enzymes can accelerate, often by several orders of magnitude, reactions that under the mild conditions of cellular concentrations, temperature, pH, and pressure would proceed imperceptibly (or not at all) in the absence of the enzyme. The efficiency of an enzyme's activity is often measured by the turnover rate, which measures the number of molecules of compound upon which the enzyme works per molecule of enzyme per second. Carbonic anhydrase, which removes carbon dioxide from the blood by binding it to water, has a turnover rate of 106. That means that one molecule of the enzyme can cause a million molecules of carbon dioxide to react in one second. term used to describe the loss of native, higher-order structure of protein molecules in solution. Most globular proteins exhibit complicated three-dimensional folding described as secondary, tertiary, and quarternary structures. Consonant with their role as biological catalysts, enzymes show considerable selectivity for the molecules upon which they act (called substrates). Most enzymes will react with only a small group of closely related chemical compounds; many demonstrate absolute specificity, having only one substrate molecule which is appropriate for reaction. ..... Click the link for more information. . The region on the enzyme molecule in close proximity to where the catalytic event takes place is known as the active site. Prosthetic groups necessary for catalysis are usually located there, and it is the place where the substrate (and coenzymes, if any) bind just before reaction takes place. ..... Click the link for more information. residues from another. The side chains of the residues in this particular geometry produce the active site that accounts for the enzyme's reactivity. the study of crystal structures through X-ray diffraction techniques. When an X-ray beam bombards a crystalline lattice in a given orientation, the beam is scattered in a definite manner characterized by the atomic structure of the lattice. ..... Click the link for more information. . The knowledge gained has led to great progress in understanding the mechanisms of enzyme chemistry. Biochemists categorize enzymes into six main classes and a number of subclasses, depending upon the type of reaction involved. The 124-amino acid structure of ribonuclease was determined in 1967, and two years later the enzyme was synthesized independently at two laboratories in the United States. A variety of metabolic diseases are now known to be caused by deficiencies or malfunctions of enzymes. Albinism, for example, is often caused by the absence of tyrosinase, an enzyme essential for the production of cellular pigments. The hereditary lack of phenylalanine hydroxylase results in the disease phenylketonuria (PKU) which, if untreated, leads to severe mental retardation in children. 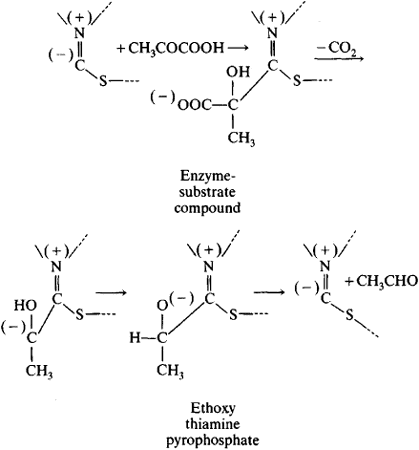 See J. E. and E. T. Bell, Proteins and Enzymes (1988). A catalytic protein produced by living cells. The chemical reactions involved in the digestion of foods, the biosynthesis of macromolecules, the controlled release and utilization of chemical energy, and other processes characteristic of life are all catalyzed by enzymes. In the absence of enzymes, these reactions would not take place at a significant rate. Several hundred different reactions can proceed simultaneously within a living cell, and the cell contains a comparable number of individual enzymes, each of which controls the rate of one or more of these reactions. The potentiality of a cell for growing, dividing, and performing specialized functions, such as contraction or transmission of nerve impulses, is determined by the complement of enzymes it possesses. Some representative enzymes, their sources, and reaction specificities are shown in the table. Enzymes can be isolated and are active outside the living cell. They are such efficient catalysts that they accelerate chemical reactions measurably, even at concentrations so low that they cannot be detected by most chemical tests for protein. Like other chemical reactions, enzyme-catalyzed reactions proceed only when accompanied by a decrease in free energy; at equilibrium the concentrations of reactants and products are the same in the presence of an enzyme as in its absence. An enzyme can catalyze an indefinite amount of chemical change without itself being diminished or altered by the reaction. However, because most isolated enzymes are relatively unstable, they often gradually lose activity under the conditions employed for their study. Enzymes are usually classified and named according to the reaction they catalyze. The principal classes are as follows. Oxidoreductases catalyze reactions involving electron transfer, and play an important role in cellular respiration and energy production. Some of them participate in the process of oxidative phosphorylation, whereby the energy released by the oxidation of carbohydrates and fats is utilized for the synthesis of adenosine triphosphate (ATP) and thus made directly available for energy-requiring reactions. Transferases catalyze the transfer of a particular chemical group from one substance to another. Thus, transaminases transfer amino groups, transmethylases transfer methyl groups, and so on. An important subclass of this group are the kinases, which catalyze the phosphorylation of their substrates by transferring a phosphate group, usually from ATP, thereby activating an otherwise metabolically inert compound for further transformations. Lyases catalyze the nonhydrolytic cleavage of their substrate with the formation of a double bond. Examples are decarboxylases, which remove carboxyl groups as carbon dioxide, and dehydrases, which remove a molecule of water. The reverse reactions are catalyzed by the same enzymes. Isomerases catalyze the interconversion of isomeric compounds. Ligases, or synthetases, catalyze endergonic syntheses coupled with the exergonic hydrolysis of ATP. They allow the chemical energy stored in ATP to be utilized for driving reactions uphill. The majority of enzymes catalyze only one type of reaction and act on only one compound or on a group of closely related compounds. There must exist between an enzyme and its substrate a close fit, or complementarity. In many cases, a small structural change, even in a part of the molecule remote from that altered by the enzymatic reaction, abolishes the ability of a compound to serve as a substrate. An example of an enzyme highly specific for a single substrate is urease, which catalyzes the hydrolysis of urea to carbon dioxide and ammonia. On the other hand, some enzymes exhibit a less restricted specificity and act on a number of different compounds that possess a particular chemical group. This is termed group specificity. A remarkable property of many enzymes is their high degree of stereospecificity, that is, their ability to discriminate between asymmetric molecules of the right-handed and left-handed configurations. An example of a stereospecific enzyme is l -amino acid oxidase. This enzyme catalyzes the oxidation of a variety of amino acids of the type R—CH(NH2)COOH. The rate of oxidation varies greatly, depending on the nature of the R group, but only amino acids of the l configuration react. a catalytic protein present in all living cells. Almost all of the biochemical reactions occurring in an organism and in its metabolic processes are catalyzed by enzymes. By directing and regulating metabolism, enzymes play a crucial role in all vital processes. Like all catalysts, enzymes reduce the amount of activation energy that is required for the completion of a chemical reaction by channeling the energy along an indirect path, that is, through intermediate reactions, which require far less activation energy. Thus, the reaction AB → A + B in the presence of an enzyme (E) proceeds in the following manner: AB + E → ABE and then ABE → BE + A and BE → B + E. For example, the completion of the hydrolysis reaction of saccharose disaccharide, which results in the formation of glucose and fructose, requires 32,000 calories per gram molecule of saccharose without a catalyst (1 calorie = 4.19 joules). However, if the reaction is catalyzed by the enzyme β-fructofuranosidase, the required activation energy amounts to only 9,400 calories. A similar reduction of activation energy under the influence of enzymes results from a redistribution of electron density and some deformation of the substrate molecules. This deformation occurs during the formation of the intermediate compounds of the enzyme-substrate complex (ABE). The deformation weakens the intramolecular bonds, leads to a reduction of the activation energy required, and consequently accelerates the course of the reaction. History. In 1814 the Russian chemist K. G. S. Kirkhgof discovered the enzymatic action of an aqueous extract of germinated barley seeds, which converted starch into sugar. Kirkhgof’s studies laid the foundations of enzymology as an independent branch of biochemistry. In 1833 the French chemists A. Payen and J. Persoz were the first to isolate the enzyme amylase from malt, an achievement that fostered the development of preparative enzymology. In the mid-19th century a dispute on the nature of fermentation took place between L. Pasteur and J. von Liebig, P. E. M. Berthelot, and C. Bernard. On the basis of his previous research, Pasteur advanced the idea that fermentation occurred only in living microorganisms and was inseparable from their vital activity. Liebig and his adherents, who maintained that fermentation was strictly chemical in origin, believed that fermentation resulted from the formation in the cells of microorganisms of soluble enzymes similar to the amylase isolated from malt. However, all attempts to isolate from decomposed yeast cells a soluble enzyme capable of causing fermentation proved unsuccessful. The dispute between von Liebig and Pasteur was resolved in 1897 by the German chemist E. Buchner, who after grinding yeast together with infusorial earth extracted from this mixture a noncellular soluble complex of enzymes (called zymase by him) that caused alcoholic fermentation. Buchner’s discovery confirmed the materialist concept of fermentation and promoted the development of both enzymology and biochemistry. In the early 20th century the German chemist R. Willstätter and his associates used the adsorption method of isolating and purifying enzymes, a method first proposed by the Russian biochemist A. Ia. Danilevskii for the isolation of pancreatic enzymes. Willstatter’s research, although it helped determine the properties of certain enzymes, led to the erroneous conclusion that enzymes do not belong to any of the known classes of organic compounds. In 1926 the American biochemist J. Sumner isolated and crystallized the enzyme urease from jack beans, and in 1930 the American biochemist J. Northrop isolated the proteolytic enzyme pepsin in crystalline form. These achievements clarified the chemical structure of enzymes, facilitated the isolation of enzymes in highly purified crystalline form, and confirmed that enzymes are proteins. Since the mid-20th century the development of methods of physicochemical analysis (mainly chromatography) and of protein chemistry has helped determine the primary structure of many enzymes. For example, the research of the American biochemists S. Moore, W. Stein, and C. Anfinsen proved that the enzyme bovine pancreatic ribonuclease is a polypeptide chain composed of 124 amino-acid residues joined in four places by disulfide bridges. The secondary and tertiary structures of a number of enzymes have been determined by means of X-ray structural analysis. For example, the English biophysicist D. Phillips proved in 1965 by means of X-ray structural analysis that the enzyme lysozyme has a three-dimensional structure. In addition, it has been proved that many enzymes also have a quaternary structure, that is, their molecules consist of several protein subunits, which are identical or different in composition and structure (seeBIOPOLYMERS). General characteristics. All enzymes are divided into two large groups: enzymes composed solely of protein and enzymes consisting of a protein component known as the apoenzyme and a nonprotein component termed a prosthetic group. The research of O. Warburg, A. Theorell, F. Lynen, F. Lipmann, and L. Leloire established that the prosthetic groups of many enzymes are derivatives of vitamins or nucleotides and also led to the discovery of the important functional relationships among enzymes, vitamins, and nucleotides, which are the structural building blocks of nucleic acids. An example of a compound enzyme is pyruvate decarboxylase, which catalyzes the decomposition of pyruvic acid into acetalde-hyde and carbon dioxide: CH3COCOOH → CH3CHO + CO2. The prosthetic group of pyruvate decarboxylase—thiamine pyrophosphate—is formed by a molecule of thiamine (vitamin B,) and a pair of phosphoric-acid radicals. The prosthetic groups of a number of important oxidation-reduction enzymes, the dehydrogenases, contain either a derivative of nicotinic acid (niacin) or of riboflavin (vitamin B2). Pyridoxal phosphate, a derivative of vitamin B6, is included in the prosthetic group of the pyridoxal enzymes, which catalyze the transfer of the amino group (—NH2) as well as decarboxylation and a number of other transformations of amino acids. A prosthetic group of enzymes that catalyze the transfer of such organic-acid residues as acetyl (CH3CO—) includes the vitamin pantothenic acid. Other examples of compound enzymes are two important oxidizing enzymes, catalase and peroxidase. Catalase catalyzes the reaction of the breakdown of hydrogen peroxide into water and oxygen, and peroxidase uses peroxides to oxidize certain compounds, for example, polyphenols, with the ensuing formation of homologous quinone and water. The catalytic action of these enzymes may be reproduced by means of trivalent iron ions. The minimal catalytic action of these ions may be increased if the iron atom forms part of the compound heme. Although heme already has a significant catalytic action, its catalytic activity is nevertheless several million times less than that of the enzyme catalase, in which heme is bonded to a specific protein as a prosthetic group of this enzyme. Heme also has a weak peroxidizing action, which is manifested fully only after heme combines with a specific protein into the compound enzyme peroxidase. Thus, the combining of a prosthetic group with a protein leads to a marked increase in the group’s catalytic activity. The specificity of the enzyme action, as well as the catalytic activity, depends on the nature of the protein. The strength of the bond between the prosthetic group and the apoenzyme varies in enzymes. In some enzymes this bond is weak; examples are the dehydrogenases, which catalyze the oxidation of various substrates by detaching their hydrogen. Such enzymes easily break down, for example, during dialysis, and separate into the prosthetic group and the apoenzyme. Prosthetic groups that are easily detached from the protein component of an enzyme are called coenzymes. Many enzymes contain metals, without which enzymes are inactive. These metals are called cofactors. For example, peroxidase and catalase contain iron; ascorbinatoxidase, which catalyzes the oxidation of ascorbic acid, contains copper; and alcoholdehydrogenase, which oxidizes alcohol in homologous aldehydes, contains zinc. A dipeptide consisting of the radicals of two molecules of arginine yields only half of the theoretical quantity of urea when the dipeptide is acted on by arginase. It is evident that although the decomposition of arginine occurs in an area remote from the carboxyl group COOH (indicated by the broken line), an essential condition for the action of arginase is its combination with the carboxyl group of arginine. For this reason, either displacement of the hydrogen in the carboxyl group to the methyl radical or the bonding of the carboxyl group with the second molecule of arginine strongly influences the action of arginase. Examples of the specificity of enzyme action may be observed by examining the stereochemical specificity of enzymes, that is, the action of enzymes on stereoisomers. For example, enzymes that oxidize natural L-amino acids do not affect the D-isomers of the same amino acids, and the enzyme dipeptidase, which hydrolyzes dipeptides consisting of radicals of L-amino acids, does not affect dipeptides composed of D-amino acid residues. Observation of the specificity of enzyme action led the German chemist E. Fischer to compare a given substrate and the enzyme catalyzing its transformation to a lock and its key. The stereochemical specificity of enzymes is closely related to one of the basic features of living organisms: their ability to synthesize optically active organic compounds. Enzymes have a highly specific action because of their protein nature. For example, pyridoxal enzymes that contain the coenzyme codecarboxylase may belong to different classes and may catalyze diverse reactions. The specificity of these enzymes’ action depends on the nature of the given apoenzyme. Conditions of enzyme action. Enzyme action depends on a number of factors, primarily temperature and the reaction of the medium (pH). The temperature conducive to optimum enzymatic activity is generally in the range of 40°–50°C. At lower temperatures the enzymatic reaction is generally slower, and at temperatures approaching 0°C, it virtually ceases. Temperatures higher than 40°–50°C also slow down the enzymatic reaction and eventually inactivate it. The reduced intensity of enzyme action in the presence of higher temperatures is caused mainly by the incipient destruction (denaturation) of the protein component of the enzyme. Since proteins in a dry state are denatured more slowly than hydrated proteins, which are usually in the form of a gel or solution, the inactivation of an enzyme occurs much more slowly in the dry state than in the presence of moisture. For this reason, dry bacteria spores or dry seeds are able to withstand far higher temperatures than wet spores or seeds. The Danish physical chemist S. Sarensen was the first to establish that pH is an important influence on enzyme action. Enzymes vary according to the pH value that is optimal for their action. Pepsin, for example, which is contained in gastric juice, is most active in a strongly acidic medium (pH 1–2), and trypsin, a proteolytic enzyme secreted in the pancreas, has an optimum action in a weakly alkaline medium (pH 8–9). The optimum action of papain, a proteolytic enzyme of vegetable origin, occurs in a weakly acidic medium (pH 5–6). Enzyme action also depends on specific activators and on nonspecific or specific inhibitors. For example, enterokinase, which is secreted in the pancreas, converts inactive trypsinogen into active trypsin. Similar inactive enzymes in the cells and secretions of various glands are called proenzymes. Many enzymes are activated by compounds containing the sulfhydryl group (—SH); among these compounds are the amino acid cysteine and the tri-peptide glutathione, which is found in every living cell. Glutathione has an especially strong activating effect on some proteolytic and oxidizing enzymes. Nonspecific inhibition of enzymes is caused by substances that form insoluble precipitates with proteins or that block certain groups within proteins, for example, the—SH group. There are also specific inhibitors of enzymes; these inhibitors suppress catalytic functions by bonding with chemical groups in the enzyme’s active center. For example, carbon monoxide (CO) specifically inhibits a number of oxidizing enzymes that contain iron or copper in their active centers. Carbon monoxide forms a chemical compound with these metals, blocks the enzyme’s active center, and consequently halts the enzyme’s activity. The inhibition of enzymes can be reversible or irreversible. In reversible inhibition, for example, in the action of malonic acid on succinic dehydrogenase, the enzyme’s activity is restored when the inhibitor is eliminated by dialysis or by another method. In irreversible inhibition the action of the inhibitor, even when the inhibitor is present in very low concentrations, is gradually intensified and eventually halts an enzyme’s activity completely. The inhibition of enzyme action may also be competitive or noncompetitive. In competitive inhibition the inhibitor and the substrate seek to displace each other from the enzyme-substrate complex. High concentrations of a substrate reduce the action of a competitive inhibitor but maintain the action of a noncompetitive inhibitor. The action of activators and inhibitors on enzymes is of great importance in the regulation of enzymatic processes. Classification and nomenclature. In 1961 the International Union of Biochemistry recommended that enzymes be divided into six main classes: oxidoreductases, transferases, hydrolases, lyases, isomerases, and ligases. The following numbering system was also recommended: the number, or index, of each enzyme was to contain four digits, separated by periods. The first digit would indicate the class, the second the subclass, the third the sub-subclass, and the fourth the ordinal number in the sub-subclass. According to this system, the enzyme arginase, which decomposes arginine into ornithine and urea, has the number 3.5.3.1. In other words, arginase belongs to the hydrolase class, to the subclass of enzymes that act on the nonpeptide C—N bond, and to the sub-subclass of enzymes that decompose these bonds in linear compounds, rather than in cyclic compounds. The oxidoreductase class includes enzymes that catalyze oxidation-reduction reactions. This class is divided into 14 subclasses according to the nature of the chemical group in the substrate molecule that undergoes oxidation, for example, the alcohol, aldehyde, or ketone group. The sub-subclasses of the oxidoreductases are numbered according to the type of hydrogen (electron) acceptor taking part in the reaction, for example, a coenzyme, cytochrome, or molecular-oxygen acceptor. The first three digits of the enzyme’s number identify the type of enzyme; for example, 1.2.3 designates an oxidoreductase that acts as an electron acceptor on an aldehyde that contains molecular oxygen. The transferase class, which includes enzymes that catalyze transfer reactions, is divided into eight subclasses according to the nature of the chemical groups transferred. These groups may be monocarbonic or glycosyl radicals, or they may be nitrogen or sulfur-containing groups. In the transferases, the third digit indicates the type of groups transferred; for example, the monocarbonic group may be methyl, carboxyl, or formyl. The hydrolases are enzymes that catalyze the hydrolytic decomposition of various compounds. The hydrolases are divided into nine subclasses according to the type of bond hydrolyzed: ester, peptide, or glycoside. The third digit of a hydrolase’s number defines the type of hydrolyzed bond. The lyases are enzymes that detach a chemical group from the substrate nonhydrolytically, thus forming double bonds. Lyases also add chemical groups to double bonds. There are five subclasses of lyases. The second digit of a lyase’s number refers to the type of bond that undergoes cleavage, for example, carbon-carbon or carbon-oxygen. The third digit refers to the type of chemical group detached. Isomerases catalyze isomerization reactions and are divided into five subclasses according to the type of reaction catalyzed. The third digit of the isomerase’s number describes the nature of the substrate transformation. Ligases, or synthetases, catalyze the joining together of two molecules, a coupling accompanied by the breakdown of a pyro-phosphate bond in a molecule of adenosine triphosphate (ATP) or of a similar triphosphate. The first digit of a ligase’s number refers to the type of bond formed, for example, carbon-nitrogen or carbon-oxygen, and the second digit identifies the nature of the compound formed. Enzymes are also classified according to systematic and trivial (unsystematic) names. For example, the systematic name 2-oxo-acid carboxy-lyase corresponds to the trivial name pyruvate decarboxylase, and the systematic name L-arginine (amidinohydrolase), to the trivial name arginase. Regulation of enzymatic activity. Living organisms have control mechanisms that regulate the synthesis and activity of enzymes. The complex of enzymes within a given organism is determined by the organism’s genetic nature. However, this complex may be altered by such internal and external factors as diet, mutations, the effect of ionizing radiation, and the composition of the surrounding air. For example, such molecular diseases as alkaptonuria are caused by mutations. In this hereditary disease, changes in the amino acid tyrosine result in the formation of homogentisic acid. The homogentisic acid accumulates in the body and is excreted with the urine since patients with alkaptonuria lack the ability to synthesize the two enzymes that catalyze the subsequent oxidation of homogentisic acid: para-hydroxyphenyl-pyruvate oxidase and homogentisic acid oxidase. The influence of nutriments on the organism’s enzyme system is particularly easy to trace in microorganisms. For example, a colon bacillus (Escherichia coli) synthesizes only traces of P-galactosidase during its growth on a nutritive medium containing glucose. However, when various β-galactosides are present, large amounts of this enzyme are formed, amounting to 6–7 percent of all the proteins contained in a cell. Enzymes whose formation or intensified synthesis is caused by the influence of a compound are called induced enzymes. Other compounds may repress the synthesis of enzymes. In animals, the induction and repression of enzyme synthesis is influenced by hormones as well as by substrates and metabolites. For example, the synthesis of the enzyme glucose-6-phosphatase, which helps synthesize glucose in the liver, is induced by the hormones thyroxine and cortisone but is repressed by insulin. A general theory of the induction and repression of biosynthesis on the genetic level was formulated by the French biologists F. Jacob and J. Monod. An enzyme may be present in an organism in different molecular forms. The distinct forms of an enzyme that catalyze the same reaction but that differ in physical, chemical, and immunological properties are called isoenzymes. The synthesis of isoenzymes is determined by genetic factors, but it may be altered by environmental factors. Thus, the concentration and activity of an enzyme depend on many diverse environmental factors. These include the water, air, temperature, acidity, and light, the concentration of substrates and of cofactors necessary for enzyme action, the presence of activators and inhibitors, the concentration of metabolites, and, in higher multicellular organisms, the neural and hormonal regulation of enzyme activity. The Pasteur effect, or the inhibition of fermentation by the action of oxygen, is an example of the effect of the environment on enzyme activity. The activity of many enzymes is regulated according to the allosteric principle. Such enzymes have an allosteric site that is joined to a specific metabolite. The allosteric effector causes changes in the structure of the active center that reduce or increase the activity of the enzyme. Some enzymes exist in a cell as components of complexes containing a number of enzymes. In such complexes the activity of each enzyme is controlled by the other enzymes in the complex. An example of such a complex is pyruvate dehydrogenase, which is composed of 16 molecules of pyruvate decarboxylase, eight molecules of dihydrolipoil dehydrogenase, and four aggregates of lipoate acetyltransferase, each of which consists of 16 subunits. Such subcellular structures as the mitochondria, the microsomes, and the lysosomes, as well as the proteolipide membranes that separate these structures from the cytoplasm, help regulate enzyme activity in the cell. Many enzymes are embedded in these membranes as part of complexes of enzymes. Practical importance of enzymes. The fermentation process is fundamental to many industries, including the bread-baking, wine-making, beer-brewing, cheese-making, and distilling industries and is also fundamental to the production of tea and vinegar. Beginning in the early 20th century, the distilling industry was one of a number of industries to use the fermentation methods developed by the Japanese chemist J. Takamine. These methods made use of enzymatic agents obtained from molds or bacteria. Fermentation methods are widely used in a number of countries to saccharify starch by means of amylase into crystalline glucose or to convert starch into alcohol. When added to bread dough, concentrated amylolytic solutions of enzymes derived from molds improve the quality of the bread and reduce the time needed for rising. Solutions containing proteolytic enzymes derived from microorganisms are used in the leather industry to remove hair and soften hides, and to replace the expensive proteolytic enzyme rennin in the cheese-making industry. Solutions containing microbial pectolytic enzymes are widely used in the preparation of fruit juices; they increase the quantity of juice produced by 10–20 percent. Purified enzyme preparations are increasingly used in medicine. In both scientific research and clinical practice, highly purified enzyme preparations are used in biochemical analysis. The use of immobilized enzymes, that is, insoluble complexes of enzymes with some carriers, will undoubtedly increase. The selection of an appropriate carrier results in the formation of a highly active immobilized enzyme that is resistant to denaturants. A column filled with the immobilized enzyme may be used repeatedly to produce a corresponding reaction. Immobilized enzymes are increasingly used in biochemical analysis and in biochemical technology. Struktura i funktsiia fermentov, fascs. 1–2. Moscow, 1972–73. Feniksova, R. V. “Biokhimicheskie osnovy polucheniia i primeneniia fermentnykh preparatov.” In Tekhnicheskaia biokhimiia. Moscow, 1973. Kretovich, V. L. Vvedenie v enzimologiiu, 2nd ed. Moscow, 1974. Fermenty meditsinskogo naznacheniia. Leningrad, 1975. Fermentnye preparaty v pishchevoi promyshlennosti. Moscow, 1975. Advances in Enzymology and Related Areas of Molecular Biology, vols. 1–43. New York, 1941–75. Methods in Enzymology, vols. 1–36. New York, 1955–75. Any of a group of catalytic proteins that are produced by living cells and that mediate and promote the chemical processes of life without themselves being altered or destroyed. In the present study, the results for the redox enzymes in the exposed individuals suggest that mercury overload induces an imbalance in the redox cycle. However, NO* can be produced also by other redox enzymes such as xanthine oxidase or nonenzymatically by guanidine-substitute L-arginine analogs in the presence of NADPH [10, 11]. Some low molecular weight enzymes such as horseradish peroxidase (HRP), cytocrome c peroxidase and fungal peroxidase, commonly used for building amperometric biosensors, present a kinetic barrier for the direct electron transfer between the active sites of redox enzymes and the electrode surface (KUBOTA et al.